Urbance Clans Card Battle is a unique strategy card adventure game from Steambot, Fishing Cactus. It is full of conflicts taking place into the Animated Urbance Pilot. You will play as a gang leader who wants to take over the whole city, district after district. Takedowns will happen, show no mercy if you wanna survive. Use your clan as a shield to protect yourself. Turn after turn, put your allies in the front line against their rivals to limit more collateral damage. 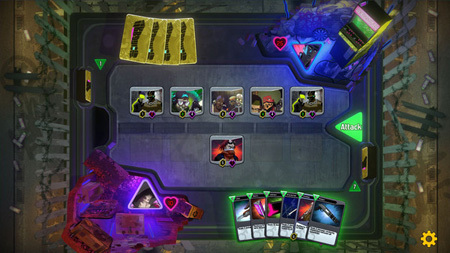 Both allies and weapons are represented as cards in your hand. Defeat all your opponents to unlock new ones that can be edited in your deck. There are more than 20 gangs to fight through 5 wicked neighborhoods, beat them all to become someone. If you still want more weapons and allies in your clan, take a to look at the Urbance Pilot to find the CODES painted on the walls by gangs. It will allow you to unlock new cards. If you get stuck in the game, check out the video walkthrough and gameplay for the game. This entry was posted in PC Games, Walkthrough and tagged Urbance Clans Card Battle Cheats, Urbance Clans Card Battle Game, Urbance Clans Card Battle Gameplay, Urbance Clans Card Battle Guide, Urbance Clans Card Battle Hints, Urbance Clans Card Battle Review, Urbance Clans Card Battle Solutions, Urbance Clans Card Battle Strategy, Urbance Clans Card Battle Tips, Urbance Clans Card Battle Walkthrough by Marvin. Bookmark the permalink.